Temperature – A measure of cold or heat, often measurable with a thermometer. Sometimes the temperature is also measurable by your mother shivering and wanting you to get done with taking the picture already! 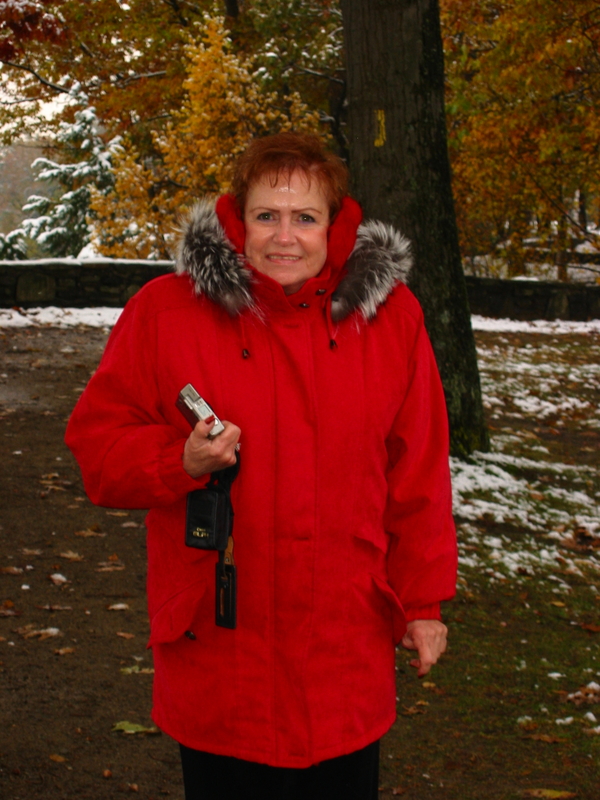 Isn’t she cute though in her red coat and matching earmuffs? Not that any of us expected snow for Halloween when she came to visit us in upstate New York. The background is at Letchworth, the Grand Canyon of the East. Word for tomorrow – PRACTICED. If you prefer to work ahead, see the list for the week under “A Word A Day”. She loved the post and still remembers how really cold she was that day. The pictures with my husband show him with just a baseball cap and his coat unzipped. He wasn’t cold at all.